In 2012, the Team set a goal to raise $15,000 for Hospice and Palliative Care of Greensboro; and, thanks to our generous sponsors, friends, relatives, neighbors, co-workers and community members, we were able to raise just over $34,000!!!!! Our first fund-raising efforts were centered around the national stage of the New York City Inaugural Ironman Championships; then, in 2013 Team Tri for Hospice focused on engaging our local community and promoted three events for our HPCG fund-raising initiatives. We partnered with the Glow-in-the-Park 5K on May 24th and the Greensboro Youth Triathlon Series’ Try-a-Tri-for-Hospice Super Sprint on June 8th; and finally, we hosted our own event, the Gears and Steers Ride for Hospice on October 27th. In 2014 & 2015 Team Tri for Hospice again partnered with the Glow-in-the-Park 5K and hosted the Ridgewood Try-a-Tri-for-Hospice and the Gears and Steers Ride for Hospice. In 2016 we expanded our scope to a national stage by participating in the Race Across America (RAAM). 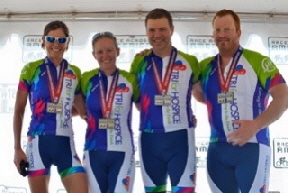 Our four-person team of Charles Fields, Chip Harris, Karen Buxton and Becky Sage cycled 3,020 miles from Oceanside, California to Annapolis, Maryland to raise awareness and funds for non-profit hospices. The team was able to donate $4535 to Hospice and Palliative Care of Greensboro and $2300 to Hospice of the Piedmont. While Hospice cares for all who need its assistance, often insurance and Medicaid do not cover all expenses; so Hospice must rely on donations to bridge that gap. I was personally touched by Hospice’s care and compassion four years ago, and my family was fortunate enough to have the resources at hand to supplement Hospice’s care for my brother during his final days. Through these initiatives, we would like to provide assistance to those who don’t have the resources to help their loved ones find this same quality of peace and comfort in their final days, as well as to educate the public on the valuable counseling resources that are available through local hospices. As we reach out to the community again for support for HPCG and other non-profit hospices, we hope that you will be able to lend your shoulder to the wheel as either a participant or donor; and we thank you for your support!